Yesterday, I added the missions infrastructure, along with a dozen or so missions, and flowers. As we close-in on User-Test-2 (UT2), things are really starting to come together nicely. Almost all of the infrastructure is in, along with token content for all, and playability is pretty decent; I’m getting pretty excited! I’ve left a few features for Beta, but they’re pretty easy. Also, there are a few bugs, but nothing terribly serious that I know. The big Beta tasks will be adding tons & tons of actual content — all the different plants, the full tech-tree, the machines you can craft, additional robots, etc. On the one hand, it’s all fairly easy work; on the other hand, it’s a lot of work! Still, one thing that has been great throughout this project is that I’ve always been able to see a clear path forward. In previous incarnations of this or similar games, I’ve tried to use fancy technology that I didn’t understand or do things in a way that required learning new frameworks which, themselves, were new and buggy and, in general, I always got caught up in fighting with my tools and then frustrated at my inability to make headway on the fun game that was in my mind’s eye. So, aside from the excitement of producing a fun game, the thing that’s really exciting to me about this project is that all of my problems are solvable, and my path to completion is clear. Sure, it’s a bit of a hike from here, but it’s an obvious path and the blockades are the kind that I know how to remove and/or get around. P.S. Optional missions that the player takes when they feel like learning something (and getting the rewards) is so much nicer than the “trapped in the tutorial” way! Today I added the basic “missions” infrastructure. Missions are sort of optional “quests” that replace the [formerly mandatory] tutorial system, offer rewards and other stuff like you expect from game missions. All the missions aren’t in, but the basic infrastructure — data base, missions menu, complete vs active, etc — is all there. Originally, I’d thought it important (as part of the fun-factor) that there be an in-game avatar representing “you” — something for the player to identify with, customize, etc. As development progressed, it became increasingly clear that the “Me-bot” served no purpose except to act as a sort of “cursor” for your finger, and he really just made every UI step require an extra tap. For example, to enter a robot and start programming it, you would (i) tap the robot, causing Me-bot to walk over there, then (ii) tap the Enter button to look inside. Same thing if you wanted to look inside the work-shed. Today, I got rid of the Me-bot. For fun-factor, I think it works that the game’s robot(s) are your creation, and they provide a sense of identity and attachment. 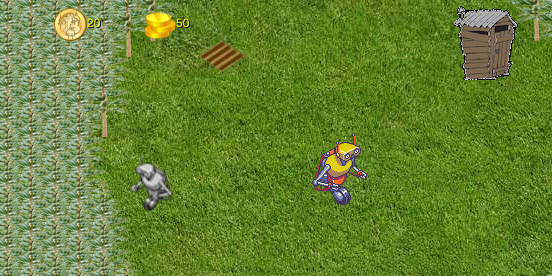 You can customize your robot(s) and make them cool. In terms of UI, we’ve halved the amount of tapping: to look inside a robot, you just tap him; to look inside the shed, you tap it. This also fixes the case where it was possible to create a robot that hacked his way deep into the forest, then planted trees behind himself then, after the new trees had grown, it would not be possible for Me-bot to get over to the robot to re-program him. No more Me-bot, no more Enter button, no more Pickup/Drop button. Less is more! All in all, things are lighter, faster and oh-so-much better. Most of my work for the next couple of weeks will be getting ready for user test 2 (UT-2). UT-1 was basically a test of the help/tutorial system, which was fairly simple, and the soldering mechanic, which is among the most complex parts of the game, in terms of mechanic. (By that I mean, in terms of what the user has to do — physically, with their finger — in order to accomplish a given task.) The outcome of UT-1 was (a) the soldering mechanic was just fine, but (b) the help system was too wordy and complicated. UT-2 will have a completely revamped help/tutorial system that is substantially more self-guided. That is, rather than walk you through all the bits of the game to teach you, we’re going to walk you through 3 simple things (maybe fewer! ), then leave the rest for the user to explore, with optional help on-demand. To that end, there’s a bit of re-work of the help system, mostly done in terms of infrastructure, though I need to re-make the actual help-content. I’ll also be adding the “suggested activity” missions, which will act as optional mini-tutorials and carry small in-game rewards. I’ve also got a weird bug in chips where there’s a delay for the signal going in/out of the chip that I hope to fix, though that could wait for Beta-1. After UT-2, my main drive will be (a) integrate feedback/things-learned from UT-2 and (b) prepare for Beta. I’ll talk more about Beta once UT-2 is almost ready to show to people. NOTE: I’m currently accepting “I want to be a beta tester” requests, though I don’t expect that to be ready for another 6-8 weeks. UT-2 is a “closed test”, sorry. If you want to be on the Beta test, PM me your email for the invite. I’ll post here a “call for Beta testers” as it gets closer, too. I also fixed the logic-gates drawer to track inventory. You’ll start with a few gates to get you going, but then you have to farm & craft to make more, if you want them. The color guy is your “Mebot”, the greyscale one is your starter-robot. BitBucks & Coins are shown, as well as a bit of the forest, a plowed patch of dirt ready for planting, and your starter work-shed. Obviously, these items are meant to be upgraded. Added the thing where you can use your robot’s “spare CPU cycles” to study various technologies. The game mechanic is: While your robot is doing menial labor (ex: sawing down trees), he’s got time to think and do research, so he can “study up” various kinds of technology. There are different types of tech for different things — you can study genetics to learn to devise better crops; you can study mechanical engineering to learn to make better tools; etc. A certain level of technical knowledge is necessary to craft certain items. Now your robot can study, which opens up more advanced parts of the game. There’s a main (?) help button that toggles the other help buttons. Things that have help have a littler (?) “this item has help” button toggled show/hide by the main one. When tapped, the little help button triggers a popup with a very simple display showing what that thing does. I tried to make an animated gif that pictographically — with very little text, just labels for AND, OR, etc. — shows how logic-gates work. I think that’s one of the most complex concepts in the game so, if I can get that right, everything else should be easy. I’m no artist, but the concept is there. I think what I have so far is “meh”; I’m hoping to do better.